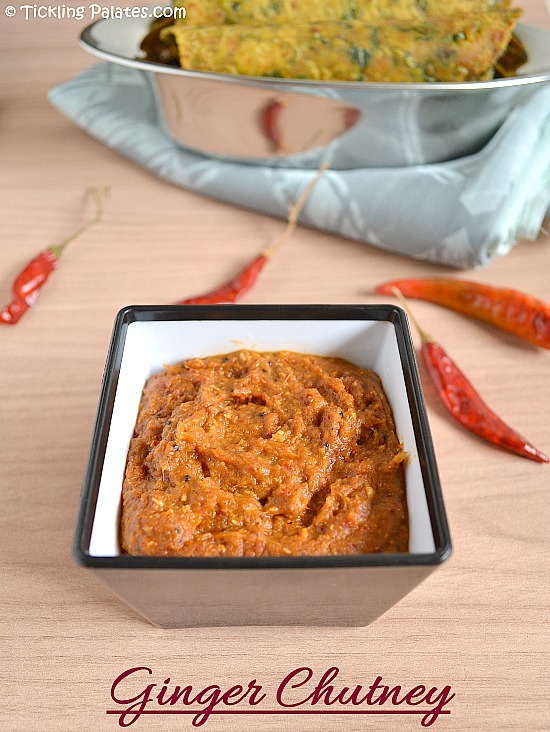 Ginger chutney recipe with step by step pictures. 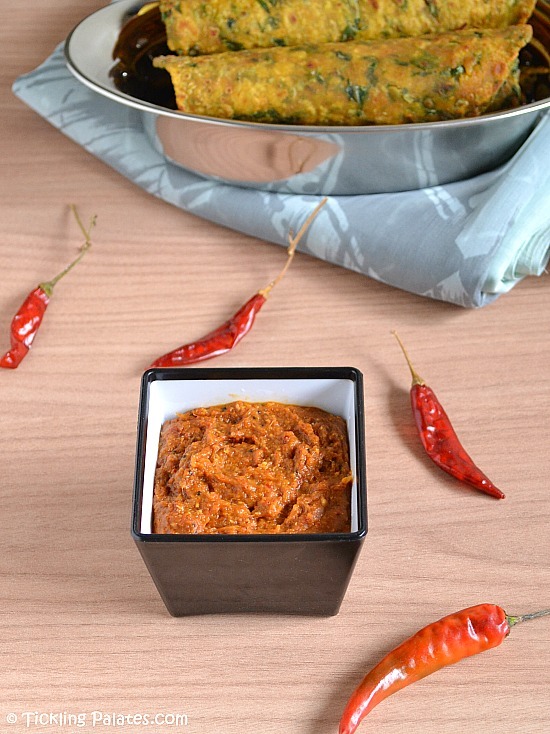 Spicy ginger chutney is served as a side dish with idli, dosa, pesarattu and theplas. Ginger, known as Inji in Tamil and Adrak in Hindi is very good for health as it has got high digestive properties. Other than using Ginger for making ginger garlic paste, I love having it in the chutney form. This is a typical Andhra style Allam Pachadi. It is very apt to pack in lunch boxes for school and office as this chutney is a bit thick and does not easily spill out thereby making a mess inside the lunch bag. Not only that, this chutney stays good for at least 3-4 days at room temperature which makes it ideal for travelling and for 10 days when stored in the refrigerator. I do not know if it keeps well beyond that, as it gets over within 2-3 days of making this chutney. As hubby is a diehard fan of idli, he wants at least 2 chutneys while eating idlis. So I always make a batch of this Inji chutney and store it in the fridge and it gets easier to make just one chutney before serving. A little bit of jaggery (vellam or bellam) is added while making this chutney and it helps to balance out the flavors by bringing down the sharp spiciness of the ginger. You can serve this ginger chutney with Idlis, dosas, poori, curd rice and theplas. Do give it a try and let me know how it turned out for you. As this is a No Onion, No Garlic Recipe, it is perfect to eat during fasting (vrat) days. 1. Whenever making ginger chutney, I always use gingelly oil, but if you do not like its flavor, you can use any vegetable oil. 2. Use only required amount water to grind the chutney and not more than that as it will make the chutney very watery. 3. 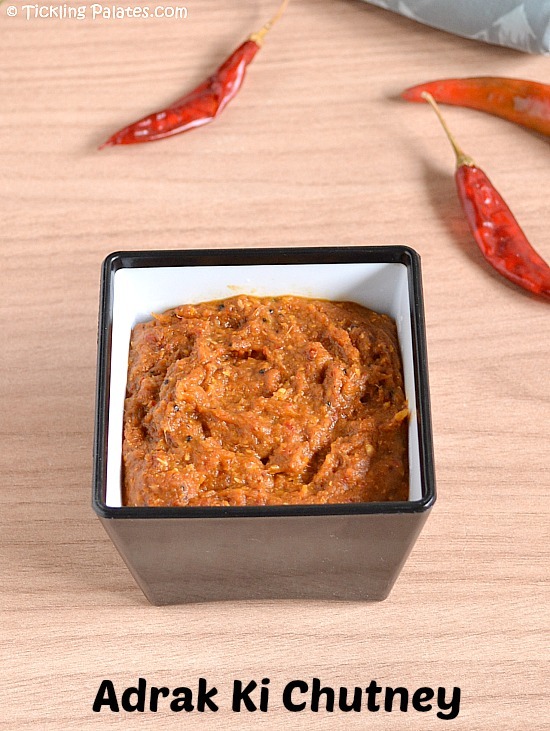 Roast the urad and red chilies over low flame and take care not to burn them or let it darken as the color of the chutney will also end up being dark. 1. Heat a pan with 1 tbsp oil. Add urad dal and sauté for 30 to 45 seconds over low flame. Add whole dry red chilies and once again keep sautéing over low flame till the urad dal becomes golden brown in color and the red chilies get roasted well. 2. Add the thinly sliced ginger and keep cooking over low flame till the slices slightly shrink in size. You can add 1 to 2 tsp more oil while sautéing ginger. This should take another 4 to 5 minutes. 3. Take the pan off fire and add the tamarind piece and mix well. The tamarind will get softened in the heat of the pan itself. Let it cool completely. 4. Transfer the ingredients to a mixie jar, add salt, jaggery and grind it to a smooth paste using little water. 5. Heat the same pan with remaining oil. Add mustard seeds and let it splutter. 6. Transfer the ground chutney to the pan and cook for 1 minute over low flame till the oil gets mixed well with the chutney. 7. Ginger chutney is ready. Take off fire and let it cool. 8. Transfer to a clean, dry container and use a dry spoon while using the chutney. Serve as an accompaniment with idli or dosa. 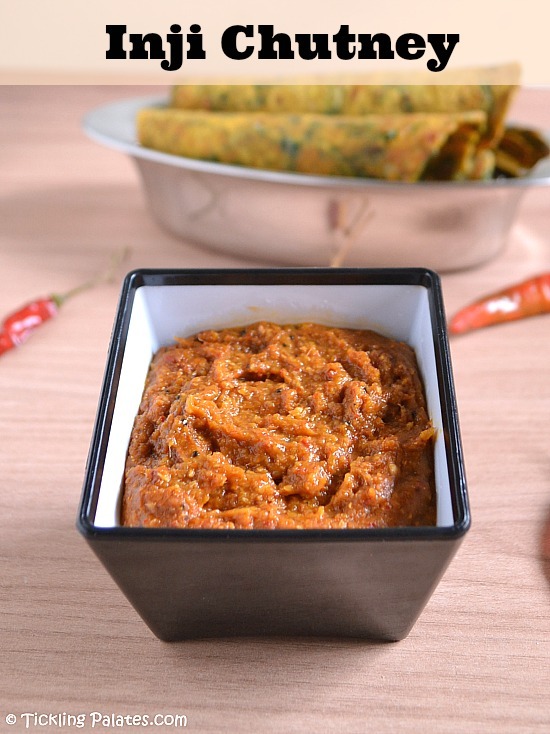 ginger chutney or inji chutney recipe is a spicy side dish served with idli or dosa. Wash the ginger well under running water till it is completely clean. Slice them into 1/4 inch thick slices and keep aside. Heat a pan with 1 tbsp oil. Add urad dal and sauté for 30 to 45 seconds over low flame. Add whole dry red chilies and once again keep sautéing over low flame till the urad dal becomes golden brown in color and the red chilies get roasted well. Add the thinly sliced ginger and keep cooking over low flame till the slices slightly shrink in size. You can add 1 to 2 tsp more oil while sautéing ginger. This should take 4 to 5 minutes. Take the pan off fire and add the tamarind piece and mix well. The tamarind will get softened in the heat of the pan itself. Transfer the ingredients to a mixie jar, add salt and jaggery. Grind it to a smooth paste using 1 to 2 tbsp water. Heat the same pan with remaining 2 tbsp oil. Add the ground chutney to the pan. Cook for 1 minute over low flame till the oil gets mixed well with the chutney. Take off fire and let it cool. Transfer to a clean, dry container and use a dry spoon while using the chutney. Serve as an accompaniment with idli, dosa, theplas, pesarattu and parathas. Nice one. I would definitely like to try this ginger chutney. Thanks. wow !!! this shud be out of the world !!! so tempting ! Happy New Year in advance, dear. Colr seems to be good let me try it.